If I were to ask you four simple questions about the project you are working on right now, they would be easy to answer, right? Try it. Say it to yourself. Now try telling a colleague. Does it make sense? Was it brief and to the point, or a bit disjointed and ambiguous? Was it suspiciously close in tone to “We’re redesigning our website for my boss, by launching in 6 months to give it a much needed makeover”? Sadly, I suspect you’re not alone in working predominantly on projects with a distinct lack of clarity regarding their purpose, audience, vision and goals. We’ve all been there. So it should come as no surprise that being able to concisely articulate these four essential elements of a project is crucial. If digital agencies and organisations alike were more vigorous in ensuring every project was bound to them, they would likely see many more successful project outcomes. They are the bricks and mortar of everything we do. Without these pillars, every investment of blood, sweat, tears, passion and joy we put into our work suffers from a distinct lack of foundation; risking collapse under even the slightest interrogative gust of wind. 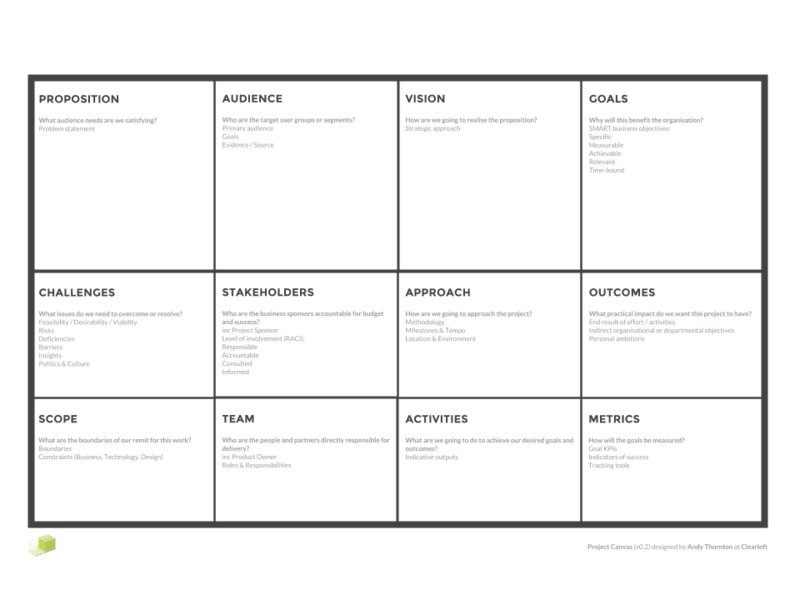 It was with this unnervingly frequent recurring problem in mind that I’ve recently been experimenting with a Project Canvas as a means of making these details as explicit as possible at the start of a project. Existing solutions I’ve used previously always felt to have lacked the appropriate substance and focus: Either too lofty in scale or scope to be practical (See Business Model Canvas as a good example) or too granular and managerial to convey a higher purpose (See, well… every other canvas?). A consolidated and concise brief. Nothing is worse than trying to work from someone else’s understanding of the brief. A cacophony of disparate, overlapping, ambiguous kick-off meetings with Account Managers, Product Owners, Project Managers, Creative Directors, all giving their own nuanced (and in many instances, completely alternate) focus on the undertaking at hand. A way to align the team and baseline knowledge. It’s painfully easy to fall into the trap of making assumptions about pre-existing knowledge when onboarding new team members and stakeholders onto a project. What makes it even harder is that the deeper the immersion in a project, the more assumptive and opaque your communication becomes, exposing blindspots from which confusion and divergence emerge. It’s important that everyone is quickly able to get on the same page, and has a common definitive point of reference to help refocus direction when required. A repeatable approach to scope and plan discovery activities. The only thing you know for certain at the start of a project is that you know absolutely nothing. So a simple and transparent way to understand the lay of the land, in terms of a project’s sophistication or maturity of thinking, is essential. The ability to hit the ground running at the start of a project, by having the confidence to ask (and make a plan on how to answer) pertinent and practical questions can make all the difference. A strategic purpose to the work. The most important aspect of any project is the meaning behind it. Without the motivation to progress and improve, and an objective rationale to defend otherwise subjective design decisions, everything can be made instantly malleable by the fickle and transient whims of high ranking Swoop-n-Poopers. So was that too much to demand? Probably. But I came up with something regardless. Project Canvases are clearly not a new thing. This is by no means a revolutionary approach, given there are already an over-abundance of similar tools and techniques readily available. 2015 has seen the industry hit peak canvas, with colleagues around the office glazing over merely at mention of the format. It’s summative, avoiding unnecessary detail. As a single sheet it can provide a useful ‘at a glance’ overview, with its size and boundaries naturally constraining the level of information that can be added. It’s visible and tangible. Unlike a typed document, hidden away on a project folder or Basecamp, it’s easy to print out or write on a wall for all to see. It’s relational. When done well, it borrows from visual thinking techniques, such as mindmaps, sketch notes, or graphic storytelling and meeting facilitation. It helps make relationships between information explicit, by virtue of where it is placed spatially and its proximity to neighbouring information. The vertical and horizontal planes of the canvas are tailored to differing levels of detail and the focus of the information required. The three rows from top to bottom provide an appropriate level of detail for the various stakeholders and team members who will be engaged on the project. The intention being that c-suite bigwigs, project sponsors, account managers and anyone removed from the day-to-day specifics of the project can quickly scan across the top of the canvas to gain a strategic overview. Similarly, project managers, data analysts and tech partners seeking detail on the practical mechanics can focus at the bottom. What customer/audience/user needs are we satisfying? This is the projects ultimate raison d’être, and one unfortunately all too often overlooked. When completing this it can be quite useful to do so as an individual exercise, by asking all participants to write what they believe the proposition to be, and then sharing with the group to discuss and hopefully reconcile (in a follow-up session if needed). What issues do we need to overcome or resolve? Are there any specific technical, business or user issues or insights that should be shared? Remember that organisational politics and culture are often overlooked or ignored despite being big hurdles that have enormous impact on project success. This line of questioning needs to be delicately handled. What are the boundaries of our remit for this work? Where does the project start and end? The points of crossover with other teams or disciplines are often gaps assumptions fall into, so these need to be made explicit. Who are the target user groups? Specifically identifying a primary audience is invaluable to focus efforts and deprioritise peripheral needs. Briefly discuss their core goals and any existing sources of evidence which support these insights, as too often they are anecdotal assumptions missing proper follow-up validation. Who are the business sponsors accountable for budget and success? A responsibility assignment matrix such as RACI (indicating who is Responsible, Accountable, Consulted or Informed) is useful here to understand the nuances of everyones role, particularly on larger projects that have a complex mix of stakeholders. Ensure you identify the project sponsor – they’re the one ultimately paying your salary, patting you on the back or pulling the plug. Who are people and partners directly responsible for delivery? List out everyone directly working on the production of the project. Identify the primary contact from the various parties involved, such as the Product Owner and agency point(s) of contact. How are we going to realise the proposition? This is very often expressed as the brief itself in the first instance, but all too often projects are lacking an articulation of the higher purpose, or Proposition, behind it. Building an intranet, Migrating to a new CMS, Designing an app. Redesigning a website. Building an eCommerce area. These are all executions of varying levels of ambition, without any real elaboration on the purpose behind them. It’s important to get this down into a single concise statement wherever possible. Similar to the Proposition, it can be useful to complete as both an individual then a group exercise to flush out any issues with misalignment. It doesn’t need to be resolved immediately, but the sooner the better. You obviously don’t want this changing too dramatically half way through. How are we going to approach the project? Be clear on the methodology. Identify any key milestones and the tempo of demos, playbacks or presentations with the rest of the team or key stakeholders. Tempo injects confidence in those interacting with the process. Also don’t forget to flag any specific location or environment needs (such as a private room for user testing or copious wallspace for sharing work in progress or ideation sketches) that would otherwise all too easily be assumed as inconsequential ’business as usual’. What are the specific activities we will conduct? Activities are things that happen to satisfy an Outcome or Goal (see below), so these need to be considered in tandem. If an Activity doesn’t directly seem to contribute to an Outcome or Goal, it’s almost certainly not worth doing. This can also help avoid superfluous and distracting requests for your precious time further down the line. Why will this benefit the organisation? This should be the core business objective of the project (such as acquisition, retention, etc). Measurability is a crucial piece of the puzzle. All too often ignored by UX design teams, this is surely a leading cause of business stakeholders scepticism in the power of good design. If you can’t measure it, how will you know if the project has been a success? Setting objectives which are SMART is useful, so try to make every goal Specific, Measurable, Achievable, Relevant and Time-bound, if not now, soon. What practical impact will this have on ourselves, our team and our organisation? It’s important to focus on outcomes rather than outputs, so listing out deliverables here won’t cut the mustard. These are more varied softer and fuzzier objectives not covered by the measurable business Goals, which can range from individual professional ambitions to team up-skilling. What will change for the better from before? These can serve as very powerful motivations. How will the goal(s) be measured? Setting targets against which the Goals will be benchmarked and tracked (e.g. increase conversion by 10%) can provide much needed evidence for sceptical c-suite exec’s and critical stakeholders. However, it’s likely to take time and plenty of collaboration with data analysts and others to reach consensus on what is worth measuring. So far I’ve been using the canvas in kick-off or planning sessions, at the first stage the team responsible for delivery is actively engaged in the project. But there’s no reason to believe it couldn’t evolve into a simpler version for use even earlier in the initiation of a project, covering the higher altitude strategic ground only. As an activity you should allow 2-3 hours to arrive at a first draft of the canvas, which breaks down into 10-15 minutes per theme. My preference is to recreate the Canvas headings and layout (but not the bounding boxes) on a wall using sticky notes as prompts for each theme. This has some benefits over drawing the template, and its boundaries, directly on the wall. Removing the space constraints from each section, at least to begin with, reduces any expectations around the ‘completed’ state of each. After all, the aim is not to fill each area up. I’ve yet to find a definitive starting point or sequence through the canvas, but working through the top row is typically the most sensible, as the project Vision is generally the most explicit strategic statement that can be derived from written briefs and proposals. Whether the session becomes Proposition & Audience focused (What & Who), or Vision & Goal focused (How & Why) imparts a great deal of insight regarding the ‘bottom-up’ / ‘outside-in’ versus ‘top-down’ / ‘inside-out’ nature of the organisation and the remit of your project. How you choose to react to that, and pivot your approach accordingly, can’t be underestimated. It’s important that everyone in the team who will be responsible for the execution of the work is familiar with the Project Canvas. Depending on the size of the project however, and to manage the size of a participatory session it might be necessary to limit attendance to one individual for each relevant discipline. A session of more than 10 participants can get unwieldy to manage or provide insufficient opportunity for everyone to meaningfully contribute. Depending on the mix of attendees, it can be valuable to focus on specific themes at the expense of others, though be cautious about leaving any theme completely unexplored. Also bear in mind that, despite any assertions to the contrary, participants are unlikely to arrive with all the answers, and should be made to feel comfortable in acknowledging any uncertainty. Stakeholders don’t like to feel stupid, so don’t underestimate the importance of clarifying this expectation. Remember, the canvas is a tool to facilitate a briefing session, rather than an exploratory workshop in and of itself. It can easily be mistaken as an opportunity for ideation, so the session should be carefully framed to avoid this. The aim is not to exhaustively complete the canvas as part of a single session, quite the opposite in fact. It should be seen as an opportunity to expose gaps in knowledge, and therefore serve as a springboard to identify follow up activities and workshops focused around specific areas of uncertainty for further exploration and discovery. If anything is unknown, assign it an owner for a follow up activity and move swiftly on. Subsequent tailored workshops, using techniques such as the Value Proposition Canvas or the Elevator Pitch Statement, can zoom in on specific themes in more appropriate detail as part of a dedicated and focused session. The Project Canvas is a living document, so it’s never ultimately set in stone. It can and should be modified throughout the course of the project as and when necessary. It’s intended to be made visible in the halls and on the walls of working areas, reviewed, recapped and remixed in however many slide decks and marketing materials as necessary to demonstrate a focused and aligned team. The ultimate aim of the Canvas is to impart clarity on all who touch the project in even the slightest way. The litmus test of its success therefore would be that anyone involved has the capability and confidence to clearly and concisely communicate an ‘elevator pitch’ covering the high level What, Who, How, and Why to anyone unfamiliar with the project. If you try out the Project Canvas I’d love to hear from you about how it went and how you think it could be improved. A shorter version of this article appears on the Clearleft blog.